I'm a homebody by nature, and The Meatwave is a reflection of that—I prefer to stay at home, cook, and have friends come to me rather than go out. Likewise, my sense of home is strong, making me one not apt to move around, so the fact that this Meatwave represented its second home in less than a year is kind of a big deal for me. The good news behind all the moving is that this is hopefully The Meatwave's forever home, and what better way to warm it than with tons of grilled goodies! It's hard to remember the time in which I did not like brussels sprouts. It's funny, because that sprout hater period represented more than half my life, but once I discovered how awesome these tiny cabbages can be, I made up for lost time and usually order them without haste whenever I see them on a menu. Of all the brussels sprouts I've eaten, none stand out as much as the ones from East Side King in Austin. 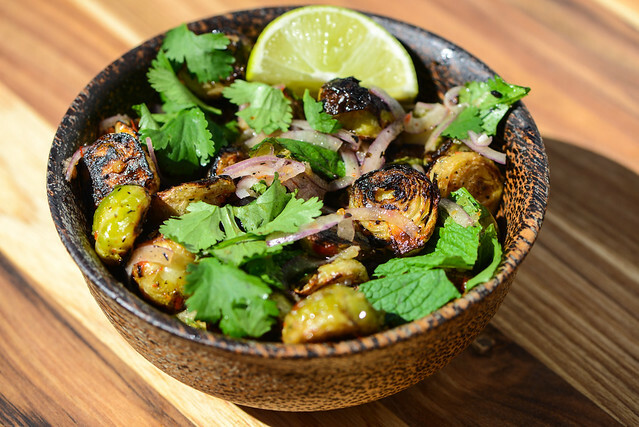 These fried sprouts, which have thin, crackling leaves, come in salad form with cabbage, onion, basil, mint, and cilantro dressed in a sweet and slightly spicy dressing. It's not something I've been able to get outside of Texas, so when I had a hankering for them a few weeks ago, I decided to make my own version done on the grill. When it comes to the run-of-the-mill Thai restaurants, you can count on me being predictable—pad kee mao and fried spring rolls is my order of choice. At the more authentic Thai joints though, I go crazy for the smorgasbord of spicy dishes that showcase the deep complexity of Thai cuisine that can span sweet to sour to tangy to bright and so much more. The standard corner Thai restaurants never really seem to achieve this in a way that piques my taste buds, which is why I stick to the almost always fulfilling broad noodles with spicy basil. There is one dish though I've found to be fairly consistently on menus at all Thai joints that starts to get at this richer contrast of flavors—spicy duck salad. 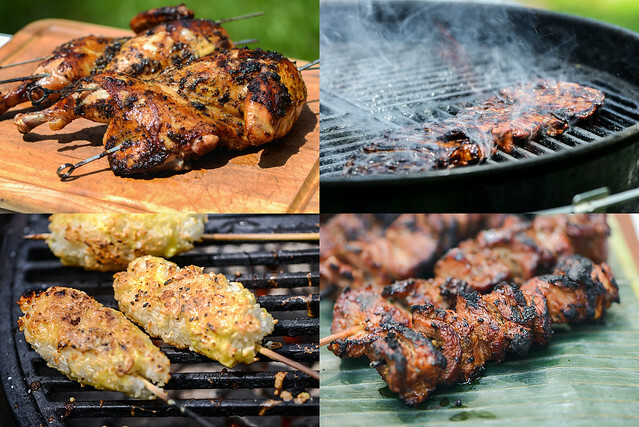 I can totally get behind a beef satay—thinly sliced, marinated flank steak becomes incredibly delicious when well seared over a scorching fire—unfortunately I can't say the same for chicken satay. 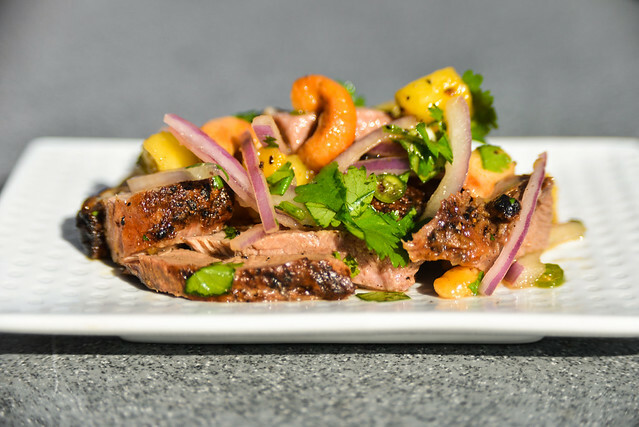 Sure, the components of the marinade are more noticeable on chicken, but it's the lack of flavor and fat in the meat itself that makes it comparatively flavorless and, all too often, dry. 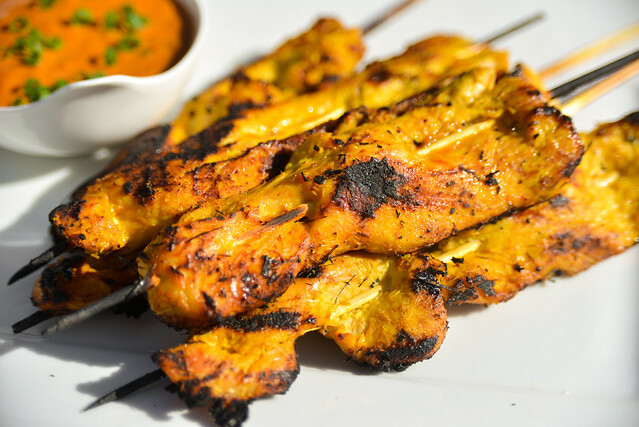 So I approached making this Thai chicken satay with some low expectations, but luckily the final product left me pleasantly surprised. I was racking my brain on what type of grand piece of meat I'd present to all of you for Labor Day. The more I thought about it, the more I got a little depressed as the grandness of this grilling holiday is quickly followed with grills being covered and quickly forgotten. It's this that got me thinking about treating the Labor Day lead-up just like any other day on the Meatwave—which still involves a lot of incredibly delicious meat, just without a grand gesture. 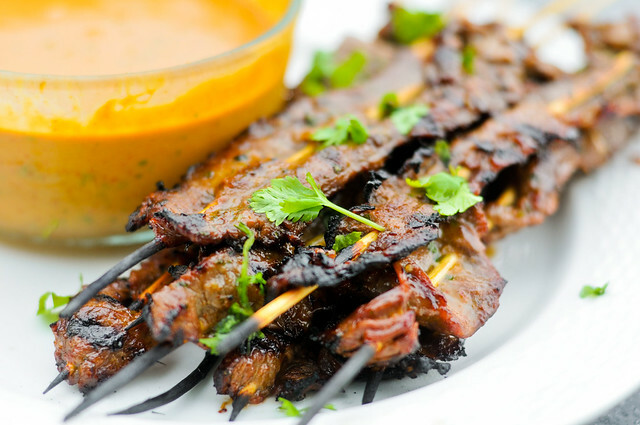 So what I have prepared for all of my meaty minions are these Thai beef satay skewers, which would be an excellent addition to any cookout menu, even if it doesn't have the presence of, say, brisket or pulled pork.